With the win over the Coyotes last night, the Blues have a record of 11-1-1 in their last 13 games. The optimism and excitement surrounding this team the last few weeks has a lot of people thinking they can actually make some noise in the upcoming playoffs. I am not in any way calling for the Blues fans to purchase their Stanley Cup Finals tickets, but making it through the first round? 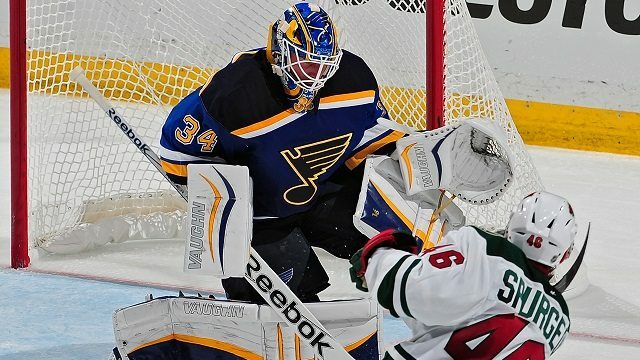 If the playoffs started tomorrow, the Blues would be facing the Minnesota Wild in the 1st round. That would put a top 3 team since the All-Star break up against a team that has gone 1-7-2 in their last 10 games and the Blues aren’t the team on the skid. The next few games are going to be critical for St. Louis. Colorado tomorrow night should be another 2 points, though nothing is guaranteed, and then the big game is Sunday against the Preds. Nashville, who is on a roll themselves (7-2-1) in their last 10 games, are only 1 point behind the Blues for the Wild in the 1st round, while the other will have to face Chicago. The anxiety most of the fans were feeling when Shattenkirk was traded, injuries began to accumulate, and a mid-season coaching change had to be made has been calmed by an effort put forth by what appears to be a complete team. Allowing the fewest goals against, while out scoring the opposition by more than double the goals (41-19) during this hot streak. The lines have stepped up as well. The kid line has caught my attention more than the others. Barbashev made his NHL debut and has not looked back, Sanford has been proving Armstrong right on his trade of Shatty, and Yakopov was left as a bust in the early months of the season, but might be the most improved player on the team in the last 2 weeks or so. The reason this line has caught my eye more than the others is because the other lines are just finally doing what was expected of them the whole season. With Lehtara out of the line up, Steen has stepped right in and may have found a spot with Tarasenko (who is just doing what he does) and Schwartz who has finally started putting the puck in the net along with his assists. The bruiser line continues to eat minutes and give the opposition fits, but last night Upshall could have had a hat trick in the first period with his opportunities. Finally, the 2nd line has excited me as well. Berglund, who is earning the new contract. I wrote before how much I liked this deal and he is proving he can be the player everyone thought he was going to be when he was drafted. Match that with a rejuvenated Paajarvi and Perron and this line has been nearly unstoppable. With all that said, they aren’t anywhere close to where they are without the goaltending that Allen and Hutton have been able to produce. Allen has been nothing short of spectacular, while Hutton has been the back up that Allen was behind Elliot last year. Even though I sit here optimistic, it is cautious optimism. I look forward to see their performance in the upcoming playoffs and always remember that it’s not always the best team that takes it all in a series…it’s the team that’s playing the best.